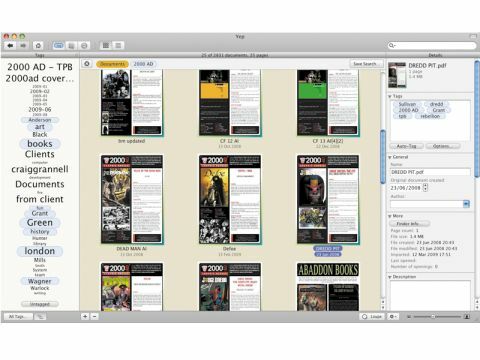 Yep claims to be iPhoto for PDFs, but is it as good as an Apple application? Bitter experience has left us sceptical when a company equates its product to Apple's. Ironic Software claims Yep is 'like iPhoto for your PDFs', but it's not – and that's because, remarkably, it's better. Superficially, Yep has much in common with iPhoto – a streamlined interface, super-fast searching, and multiple views for inspecting items. But whereas Apple's apps grab and rearrange media, Yep found 2,832 PDFs on our test Mac in seconds, and we were browsing them shortly thereafter. Also, there's no iPhoto-like library file – PDFs stay where they're saved; and when you create or download more, Yep finds them instantly. While you can visually scan PDF covers or use Yep as a functional PDF reader, much of its power lies in tagging. Tags are automatically applied based on location and Spotlight data, but you can add your own and 'auto tag' items via keywords. Tags can then be used as search aids, or to create dynamic 'smart collections'. Elsewhere, more features confirm Yep as an essential tool. The Tracking Locations sidebar enables you to drill down into nested folders, filtering the PDFs within. You can print to Yep to store web pages and copies of other text documents. Also, scanning options enable you to create PDF-based image files for storage. Although there's the odd minor UI hiccup, the manual is helpful. Yep is so useful it deserves its top marks.